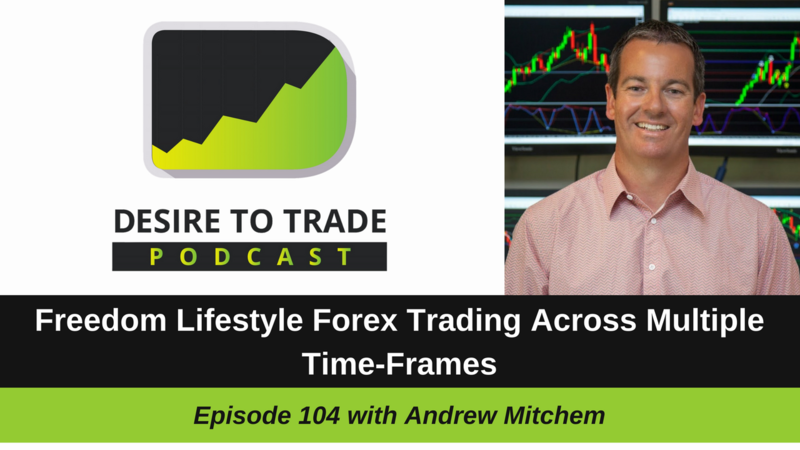 In episode 104 of the Desire To Trade Podcast, I re-interview Andrew Mitchem, a Forex trader & coach who has successfully created a “freedom lifestyle” through Forex trading. Listen to my first interview with Andrew! What’s nice about Andrew’s style is how he combines multiple time frames and manages to spend little time trading on a daily basis. I personally learned a lot from Andrew and he was the very first person who agreed to be interviewed on my podcast. He personally taught me The Money Management Principle Most Traders Don’t Know About. The Forex trading freedom lifestyle Andrew Mitchem developed for himself is very inspiring and I could personally still learn new things from that interview – in which we dive deep on trading strategies & the methods used in the Forex market. How To Find Andrew Mitchem? Great Podcast Boss,,,,i find myself not Trading lower than the 1 hour Chart,,,,so nice to hear what Andrew has got to say about Trading the Higher Time Frames. ???????????? Wow that’s nice! I thought you were scalping before? Yes Boss still Scalping,,,but i like the 1 hour Time Frame. Yesterday i done 3 Trades on Sterling and it took 22 hours before it hit my TP,,,i find Patience and Selective Trades are Key.